While player-coach Matt Goode accepts that the play-off spot may be out of reach, he still wants Banbury Bulls to cement third spot in Wadworth 6X South West One East. Bulls trail second-placed Old Centralians by three points but they are only one ahead of Marlborough. 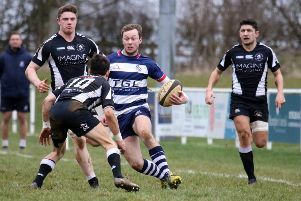 Bulls entertain Witney on Saturday at the DCS Stadium where Goode wants to see his side put on another top performance. Looking back on last weekend’s success at Wimborne which made it four wins on the spin for Bulls, Goode said: “I think we won the game with our opening 15-20 minutes. We were really clinical, we kept possession and pinned them in their own 22. “We went through multiple phases when we did score, that’s where it was won. I think the remaining hour of the game was very even. “They had some really big boys and I think defensively we had to be really switched on. We had a good regroup at half time and said what we wanted to do, and we implemented that well.